CHESS IS A CENTURIES OLD GAME AND, LIKE MANY THINGS THAT WITHSTAND THE TEST OF TIME, IT IS A GAME OF VIRTUE AND VALUE. Chess teaches children invaluable lessons that will positively impact them both in school and at home. The game of chess teaches imperative life skills, such as taking turns, thinking beyond the present moment and demonstrating sportsmanship. With Chess At Three’s innovative, story-telling based curriculum, children as young as THREE years old have begun learning (and loving) this incredibly beneficial game. 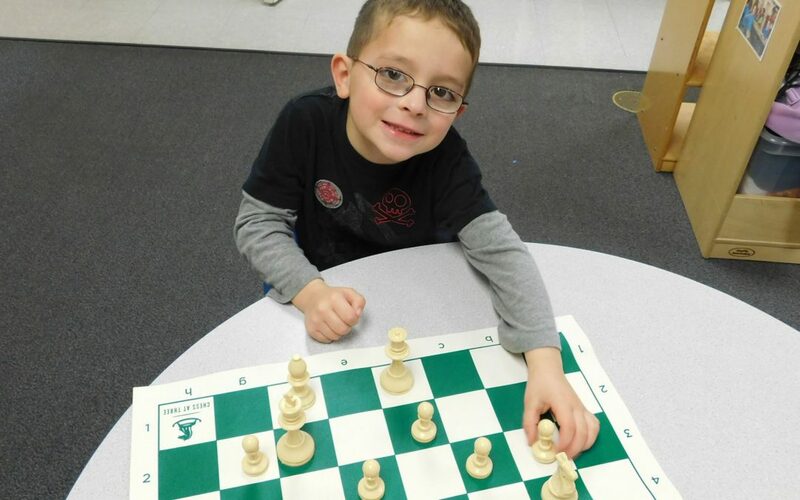 While there are many reasons we believe all kids will benefit from learning how to play chess, this month we want to focus on four fantastic lessons that chess will teach your child. LESSON #1 – CHESS TEACHES KIDS HOW TO TAKE TURNS. Parents and educators know that teaching kids how to take turns can be difficult, especially with children as young as three years old. While it may seem like a simple life skill, learning how to sit patiently and wait your turn is a hurdle for many young kids. Learning how to take turns is an important aspect of emotional intelligence (source). If you want to help your child mature their emotional intelligence, sign them up for Chess at Three’s story-based private lessons. LESSON #2 – CHESS TEACHES KIDS HOW TO LOSE. Speaking of emotional intelligence, playing the game of chess teaches young children imperative sportsmanship skills. Chess At Three goes against the grain, in regards to the “everybody wins” mentality. While playing chess, children experience both the excitement of winning and the disappointment of losing. Our students learn how to graciously lose and we always finish a game with a handshake. This is a very emotionally mature form of sportsmanship for young kids. LESSON #3 – CHESS TEACHES KIDS HOW TO CRITICALLY THINK. It almost goes without saying that chess teaches children how to think critically. After familiarizing our students with the chess “characters” (pieces), they begin to learn how to think critically about the way each piece should move around the board. Our Chess At Three students learn how to think creatively, they gain pattern recognition skills and even abstract reasoning. The critical thinking skills that develop through the game of chess are plentiful and they pay off academically. LESSON #4 – CHESS TEACHES KIDS PROBLEM-SOLVING SKILLS. Lastly, chess teaches children how to solve problems. Even when faced with a complex challenge our chess students are encouraged to think strategically about the problem. Problem-solving skills will benefit children their entire lifetime, yet it is often a hard thing to teach in school. The Chess At Three curriculum is a proven way to teach kids how to problem-solve. In short, we firmly believe chess is the most beneficial game in the worldand we love being able to bring this game to children at the record-breaking young age of three years old! Our team would love to teach your kids how to play chess through our fun, captivating stories. Email us at info@chessat3.com or call us at 844-692-2437 today to learn more and enroll your children in the Chess At Three program!